This copy is an imported version, so may differ slightly from the US version. I love this book. All the recipes work and aren't too fussy. The almonds have a lot of thyme flavor. When baking them, the egg whites cooked into a solid mass that was a bit off putting. Discovered this recipe when Michelle was looking for a recipe to make for Supper Club. This is an example of when all you need are good, simple ingredients to make something spectacular. There is nothing to this recipe. A little olive oil, s and p, and a squeeze of lemon juice. Tossed with arugula, olives, park and pancetta. Utter perfection. I replaced the savory with marjoram. The dressing went nicely with the chickpeas but the salad could use some additional ingredients. Some red onions and cherry tomatoes would go nicely. Despite the simple ingredients, the soup has a lot of flavor (particularly from the beans). However (while realizing this is a winter soup), I missed non-root vegetables in it. Very good and easy. Good side dish for a wide range of main dishes. Delicious and simple way to cook carrots. For some reason (probably because that's all that's in the fridge!) I use green olives rather than black. Last time I made the carrots weren't quite sweet enough, so I added a pinch of sugar and deglazed with some white wine, which worked well. A delicious quick dish. The technique of reducing the wine with the sausage results in a complex rich flavour with very little effort. I usually add sautéed crimini mushrooms. The recipe does not include turnips, carrots or celery. The polenta gave an interesting flavor and texture to the bread. However, the bread didn't have a lot of structure so the crumb was more similar to a soda bread than a yeast bread. Very good with legs and thighs. The cream is not necessary. I increased the mustard and tomato paste a bit. pg. 264 Recipe also calls for two whole heads of garlic. I keep returning to this vinaigrette time after time! Patricia Wells takes us on a gastronomique tour of the local food and the recipes she has been inspired to cook and create at Chanteduc - her lovingly restored farmhouse in Provence - where she has established the dream vineyard. 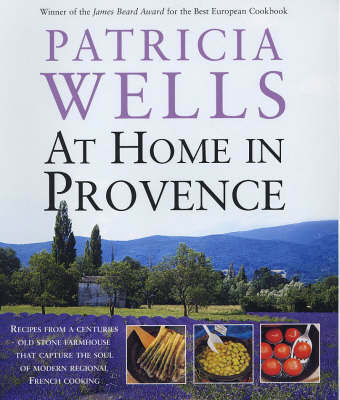 Sharing with neighbours, merchants, friends and family a love of provencal cooking, Patricia Wells At Home in Provence celebrates a cuisine that is rich with textures, flavours, colours and aromas. From Curried Courgette Blossoms to Fig, Apricot & Walnut Raisin Rye Bread, from Gigot Provencal to Corsican Cheesecake, here is a rich feast of dishes for all occasions. Combined with it are Patricia Wells' hallmarks: quotes from well known chefs and foodies down the ages and tips on shortcuts, varieties of produce and marketing. Each recipe is underlined by her cooking philosophy to keep it fresh, keep it simple, respect the seasons and allow the integrity of an ingredient to shine through. Complete with recommended wines, this is the ultimate guide to Provencal cookery.